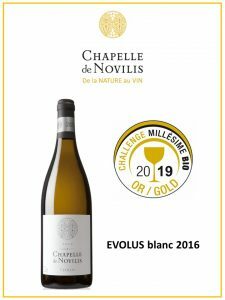 It is with pleasure and pride that we announce that CHAPELLE de NOVILIS has just obtained a gold medal at the Challenge of the largest organic wine show in the world, MILLESIME BIO, during the CHALLENGE MILLESIME BIO event, thanks to EVOLUS white. Note that this great white wine is the object of a high distinction for each vintage. This 2016 vintage has been awarded the Gold Medal but also RVF distinction, as the 2015 vintage before him. Notice to fans: the 2017 vintage is available since this week. This distinction is all the more important for us because it is awarded by a jury composed entirely of wine professionals (sommeliers, oenologists, winemakers, importers) and chaired by Philippe Faure Brac, Best Sommelier of the World. Each member of the jury, by his profession, tasted wine daily. It is therefore sharp palates that have once again recognized EVOLUS white as the great white wine it is. This gold medal is the 6th obtained by CHAPELLE of NOVILIS in only 5 vintages. 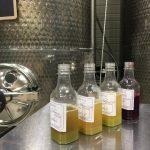 These are a total of 13 medals: 6 Gold, 6 Silver, 1 Bronze, plus 2 distinctions in the famous and very serious magazine La Revue du Vin de France, Decanter ratings as well as the Hachette Guide.